Following the numerous leaks, Samsung is about to launch of the Galaxy Grand 3 smartphone in India. The phone appeared later last year in TENAA and little before that went through benchmark testing. 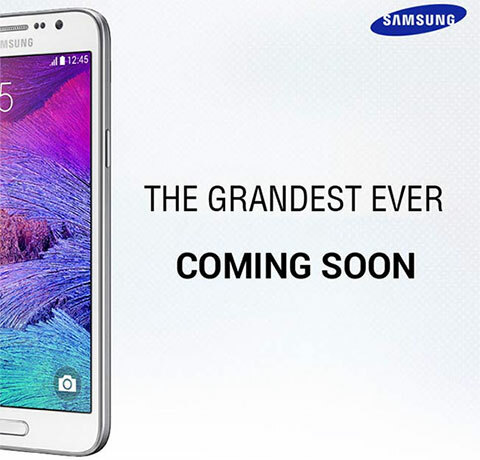 The Samsung Galaxy Grand 3 is teased as “The grandest ever” and is expected to go on sale via Snapdeal. However, a specific time frame for the launch isn’t given at this stage. Samsung has upgraded its big-sized mid-ranger all around. The 5.25” display boasts 720p resolution and under the hood, there’s a Snapdragon 410 chipset with a quad-core Cortex-A53 CPU running at 1.2GHz, 1.5GB of RAM and Adreno 306 GPU. The phone will ship with Android 4.4.4 KitKat out of the box. The Galaxy Grand 3 retains the 5MP selfie camera of the Grand Prime but upgrades the main camera to 13MP stills. Both cameras can record 1080p video. There is 12GB user-available storage, with 4GB going to Android and TouchWiz. Unsurprisingly, Samsung Galaxy Grand 3 is thinner and lighter than its predecessor. Its measures are 146 x 74.8 x 7.95 mm, while its weight tips the scale at 140 grams. pls pls pls ----------------- as early as possible release------------- , we r waiting ----------.